Remember the old annoyance about the older woman driving the Buick in front of you that was going 15 miles an hour in a 45 mile an hour zone? Those women were called "Blue Hairs" - or at least they were where I come from, and yes, they were mostly driving Buicks. Somehow a Buick became an older generation's car and not something that was a young person's vehicle of choice, because of the stigma attached. 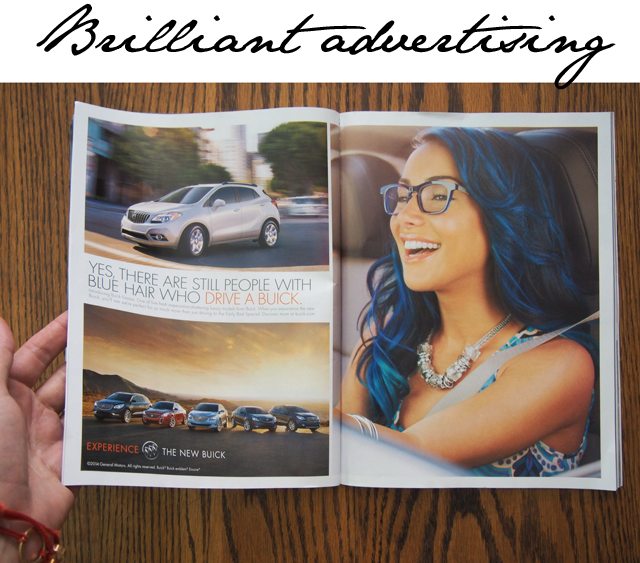 Well, Buick is using that to their advantage with some brilliant advertising this month. While reading Vanity Fair August, I came upon this double page spread and it stopped me in my tracks. A good advertisement hasn't done that for as long as I can remember. I sat there, taking in everything from the font to the main picture, the cars to the logo and layout of the page. And all it took was a good line to rope me in. And what a line, "Yes, there are still people with blue hair that drive a Buick." The quote runs alongside the twenty-something girl sporting blue hair and smiling like she doesn't have a car in the world. There is just something so magnificent about this whole setup, and yes it did make me want to go and test drive a Buick. Who ever dreamt of saying that? Bottom line - good advertising these days is very rarely seen in any magazine. We flip through dozens of pages at a time before reaching content worth stopping for. When you stop and read an ad, you know someone's doing something right.